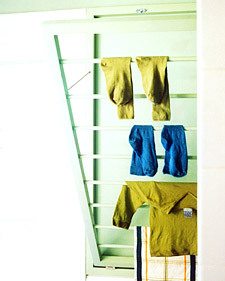 A simple foldaway rack makes ingenious use of laundry room wall space. The rack consists of two wooden frames -- a smaller one, fitted with eight horizontal dowels, inside a larger one (each is painted to match the wall).The frames are hinged at the bottom, and the larger frame is attached to the wall. A small metal latch at the top keeps the rack closed when not in use. When open, the inner frame is held by eye hooks and chains.